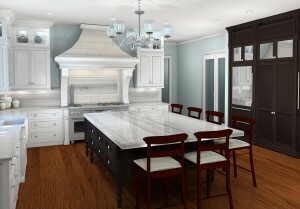 Millennium Cabinetry takes pride in offering a vast variety of services. Our award-winning design team provides the most detailed and comprehensive drawings and photo-realistic renderings that turn your visions to life. Millennium offers complete design services from conceptual space planning through selecting and ordering appliances, tile, granite, flooring, lighting and plumbing fixtures. Within our construction division, a licensed builder is on staff to offer complete renovation services on both a large and small scale. At Millennium, we employ our own team of skilled building trades. We coordinate and oversee every aspect of the project to truly make Millennium a one-stop design & service destination.